I caught a swarm of bees a few days ago. It’s strange, but I think the bees called me over to them somehow. They beckoned me with their minds. I was unloading my truck and decided to stop what I was doing to go look at our macadamia nut tree. I walked around it and smelled the wonderful blooms on it. 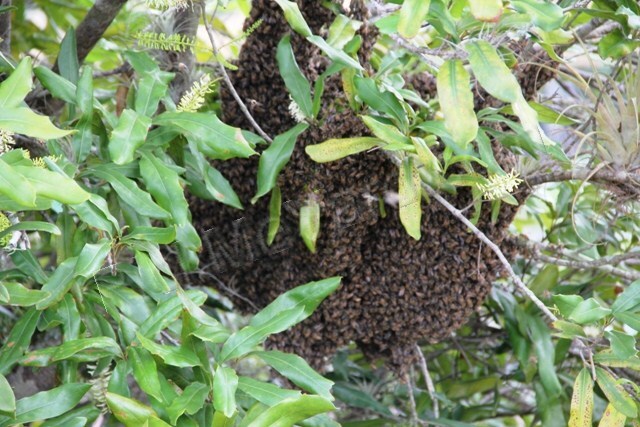 Then I noticed something dark up in the tree… a cluster of honeybees. Blooms on our macadamia nut tree. A swarm of bees in our tree. They’re surrounding their queen. I believe the swarm is from one of my other hives, but I’m not sure. They probably outgrew their box and made themselves a new queen since their boxes are healthy and full of brood and honey. They could have gathered a group together with a new queen and took off to find a new home. I should have split the hive myself to prevent them from doing this because they were crowded, but I didn’t. This beekeeping practice is called a split. 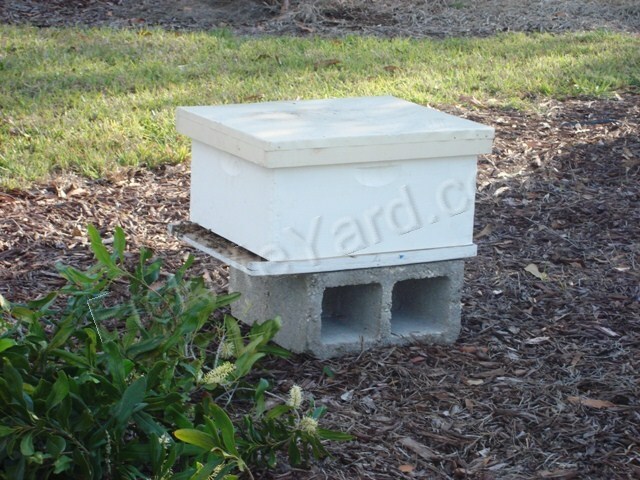 Honeybees will make pointy honeycomb on the bottom of the foundation in their boxes when they’ve made up their minds to leave. These are called swarm cells. 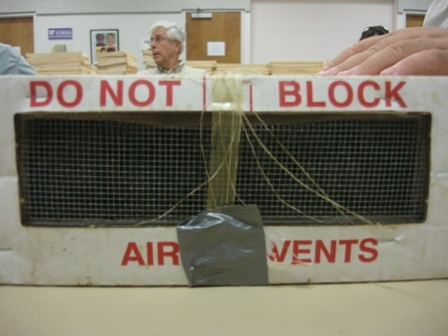 A beekeeper can pull them off to deter the bees from leaving, but it doesn’t always work. 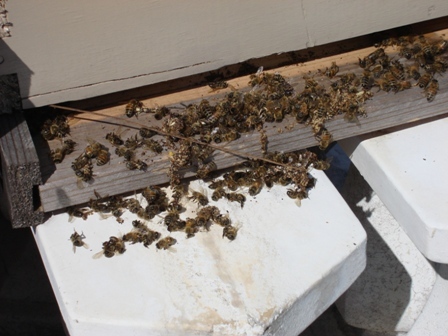 There are several methods of swarm prevention. I didn’t have a box big enough to put the swarm in so I called a fellow beekeeper. She gave me an empty bee box to put them in. (Thanks, Penelope!) 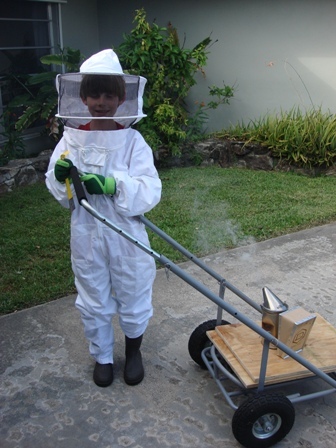 I threw on my beekeeping jacket with a veil and lit a smoker. I held the box up with one hand under the swarm and cut the branch off with big garden sheers with the other hand. This was tricky, but where there’s a will, there is a way. The idea is to get the queen into the box so the bees will stay. If the queen flies off, her swarm will go with her. I was lucky that the swarm was on a low branch. Penelope gave me a queen cage to put the queen in if I could catch her. It would be set into the box between the foundation. The toothpicks would help the cage stay between the foundation. There’s a little bit of marshmallow stuffed into the end. The honeybees would eat through the marshmallow over a couple of days to let their queen out. 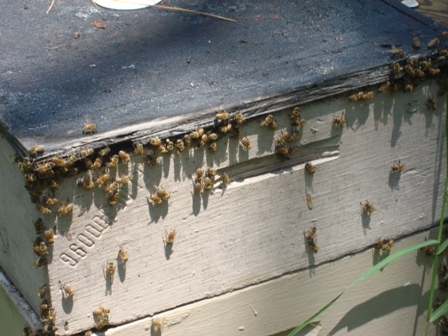 This process would up the odds that the honeybees would stay in their new box. I couldn’t catch the queen. I couldn’t even find her. The bees started getting frustrated with me since I was taking so long so I just gently put the top on their box and walked away. Within a few minutes, every single bee had made its way into the box. 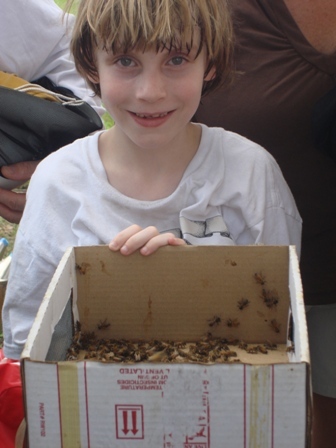 Every one of these bees went into the box because their queen was in there. It’s been a few days now and the honey bees are still in their box. I opened them up and they’re making beautiful white comb. My instincts tell me they’re not going anywhere and have found their new home. New home for honeybee swarm. Soon I will re-queen them to keep them gentle. 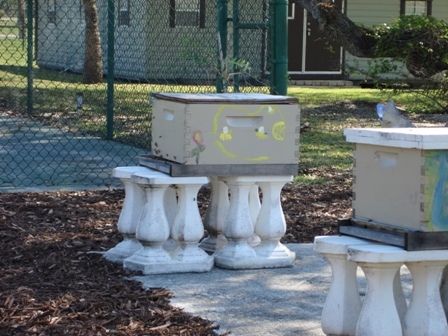 This is an important step for beekeeping in Southwest Florida. 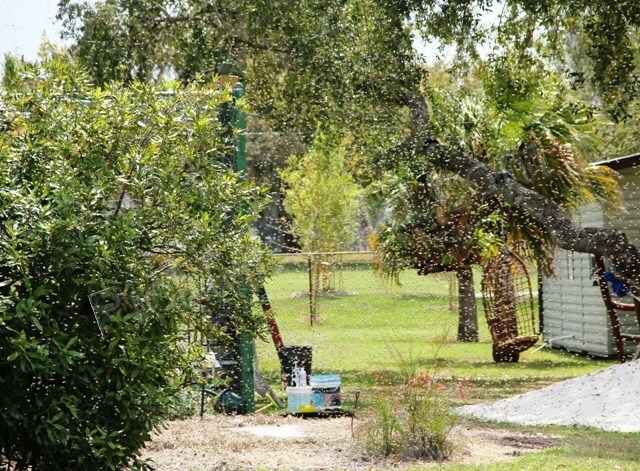 The practice of capturing a swarm of honeybees is not supported in Southwest Florida because we’re in Africanized honey bee territory. I felt very comfortable catching my swarm though and I didn’t have a nervous bone in my body. I really wanted that swarm. Beekeepers develop emotional attachments to their honeybees. 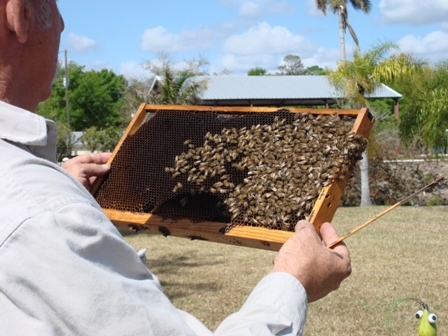 The Beekeepers Association of Southwest Florida is holding another class for beginning beekeeping on June 17, 2011. Click here for more information about them. Click here for their blog. Yosemite Sam struck gold in the hills, but we’ve found gold in our own yard! We finally harvested our first batch of honey today…liquid gold. It was really exciting for us. It didn’t come easy which made us appreciate it even more. Grayson is suited up and ready to rob the bees. 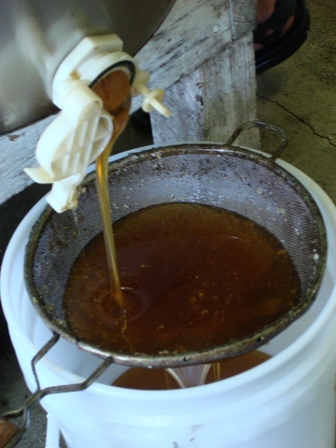 We harvested about 15 gallons of orange blossom honey out of our honey super. It’s not as much as I had hoped for but it’s enough to make us really happy. They say that food you grow yourself always tastes better than store-bought. Grayson and I took the super off the top of our bee hive yesterday. We gently brushed the bees away and brought the super of honey into our house to store it overnight. 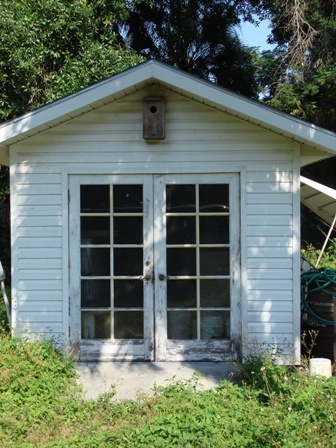 Early this morning we took the super to a friend’s honey house where he keeps his honey extractor. He is very generous to let us use it because a honey extractor costs more money than I’d like to invest. Dadant sells a hand powered extractor for over four hundred dollars. A hand-cranked extractor is a lot of work. Dadant sells an electronic extractor for over a thousand dollars. A motor driven extractor is much easier. 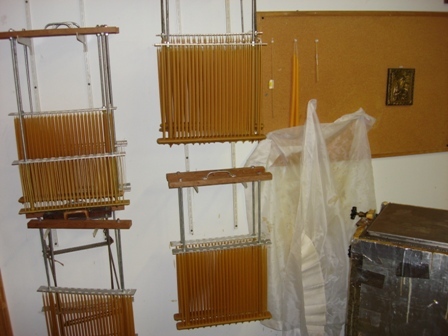 Each frame of honey has capped honey cells on it before it’s put into the extractor. 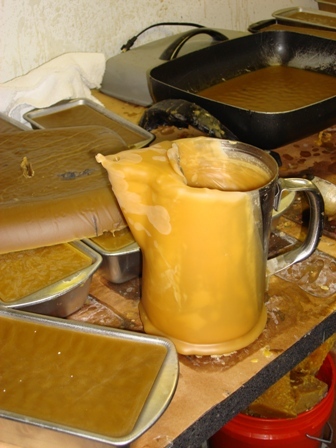 We used an electronic knife which gets really hot and cuts off the top of the capped honey with ease. The electric knife is used to cut the caps off the honey comb so the honey can be extracted. 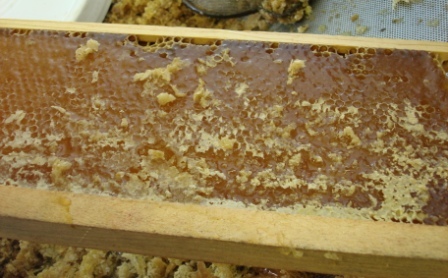 This is honey comb on the frame after the caps have been cut off. 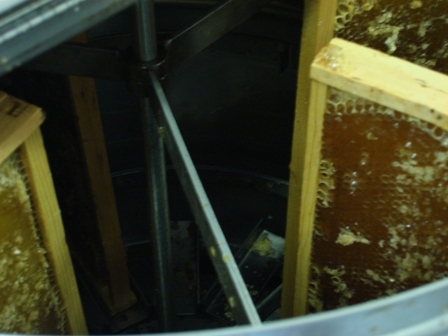 The frames are put inside the extractor and the extractor spins the honey out of the frames. 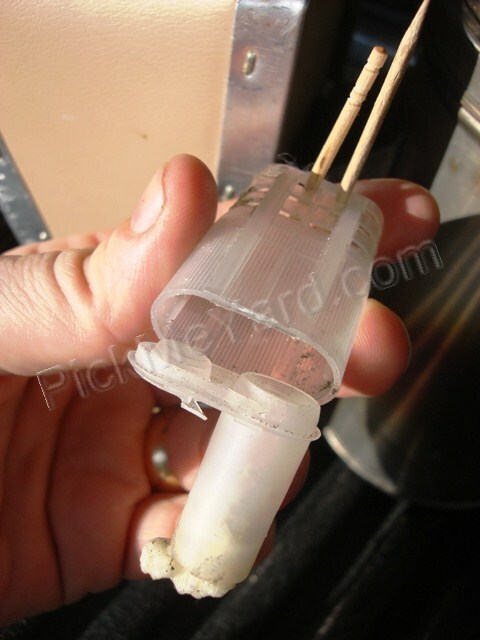 The honey comes out of a spigot at the bottom of the extractor. 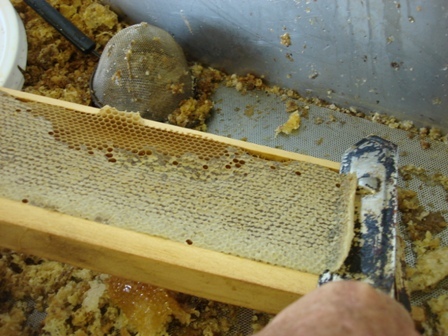 After we harvested the honey from the frames, we put the frames back into the super and back onto the bee hive. There is still honey in the frames for the bees to eat and they still have comb on them. The bees will use them again. 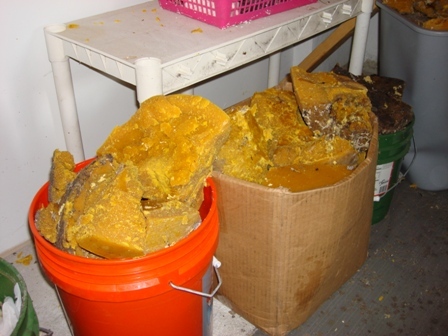 We put the wax from today’s harvest out by the bee hive when we got home. 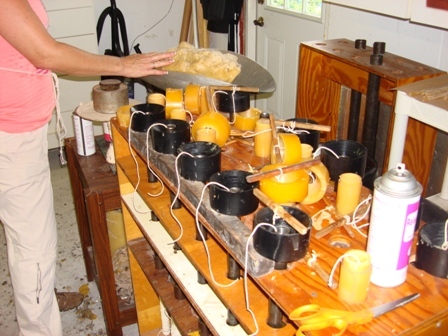 The bees cleaned the wax up for us. I’ll use the wax to make stuff like candles, lotions, and lip gloss. I filtered the honey again before I bottled it. We gave our first bottle to my mom. It was a great feeling to take her fresh honey and eggs from our own yard. Grayson said we need a couple of goats so we can have fresh milk too. That would be the icing on the cake for our little backyard. This small & delicate spider watched us closely in the honey house. 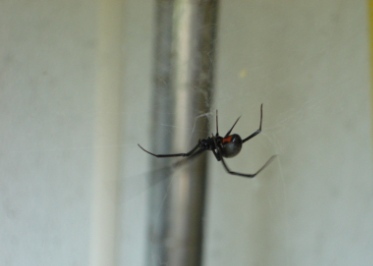 I included this picture of a black widow spider just in case you’ve never seen one. They are relatively small spiders but can be deadly. We had three of them within inches of where we had our hands today in the honey house. They have a distinctive red hour-glass on the underside of their body. We had just found a dead black widow at the front door of our house last night and put it in a jar to study it. Our house is a long way from where we found the other three widows today. We were talking about the black widow we had found at our home when we discovered the spiders just inches from where we were working. We thought that was a real coincidence. There seem to be a lot of them in Southwest Florida lately so I’m just reminding you not to stick your hands into any dark places. 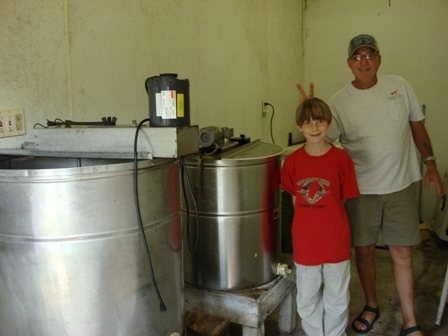 Grayson doesn’t think this post will encourage anyone to keep their own bees because of the cost associated with the honey extracting equipment. This is why we believe it is good to have friends that enjoy the same hobbies. Our local beekeeping association (BASF) has a great group of people. They’re all so much fun and so helpful. We were warned that keeping bees isn’t a cheap hobby. It hasn’t deterred us so far. Where there’s a will, there’s a way. Will mankind really perish if the honeybee perishes? I’ve done some research to try to get to the bottom of this. The honeybee populations have declined 80% in some areas of the United States and Europe. One of the main causes of this is Colony Collapse Disorder (CCD). However, the bees don’t usually die in the hive from colony collapse disorder. Studies show that they lose their orientation and cannot return home. 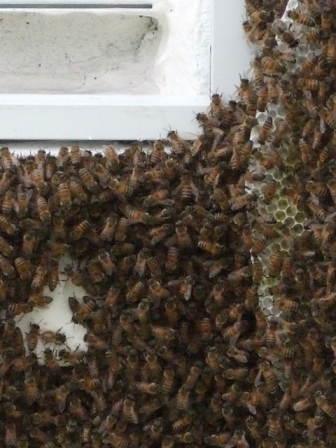 The bees that remain in the hive show signs that their immune systems have collapsed. Environmental organizations believe that stress is a factor, but they really don’t know. They have focused their studies on environmental stress, bee management stress, parasites, pathogens and fungus as possible reasons for CCD. I believe they need to take a much closer look at the genetically modified crops. Professor Hans-Heinrich Kaatz, at the University of Halle in East Germany, found that a certain genetically modified corn has a bacterial toxin that alters the surface of the honeybees intestines. Apparently his funding was taken away before he could investigate it any further. The best thing we can do for the bees in our yards is avoid pesticides. My bees in the above picture are dead and I think it was because they got into poison somewhere in my neighborhood. Bee Boxes on a Table. There is a quote floating around from Albert Einstein that states, “if the bee disappeared off the surface of the globe man would only have four years of life left. No more bees, no more pollination, no more plants, no more animals, no more man”. I am unable to find proof that Einstein actually said this. I don’t know if humans would cease to exist without honeybees because I can’t wrap my mind around that concept. I’m not very good at writing science fiction. However, I do believe it would be an epic ecological disaster and would probably have a negative impact on the human population. I can’t help but play out a Mad Max scene in my head. Bees do play a vital role in keeping our ecosystem in balance and are absolutely necessary for our food supply. Would humans be able to find food without them? There are many risks to humans and planet earth. Check out Wikipedia’s Risks to Civilization website for all the ways civilization could meet its demise. For now, I just hope that we can raise our youth with the tools they will need to find the solutions to the challenges that are ahead. The honey bee (Apis mellifera) is not native to the Western hemisphere. Stingless bees are native and do produce small amounts of honey. They also pollinate, however are not prolific pollinators like the honeybee. In 1622, the Apis mellifera were shipped into Virginia from England. From that point on they were distributed to many other states. 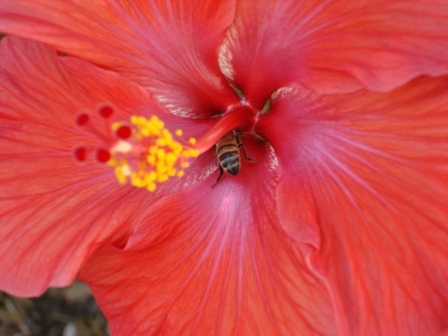 A honey bee on a hibiscus flower. Early beekeepers used to kill their bees when they harvested their honey. In 1852, a man named L.L. Langstroth designed the bee hive that we still use today. He is considered the “father of modern beekeeping”. 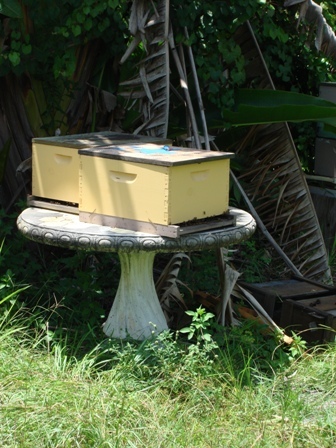 There doesn’t seem to be a reason to change the standard bee box that all serious beekeepers use…it works. 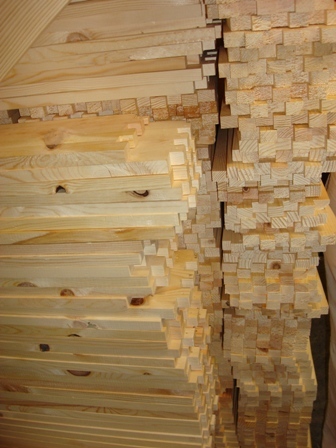 Wood that is cut and being used to build bee hives. In the mid 1800’s a market developed for purchasing queen bees. After all, it is the queen bee of the colony that determines what type of genetics your bees will have. She can be a productive mating machine or… not so productive. 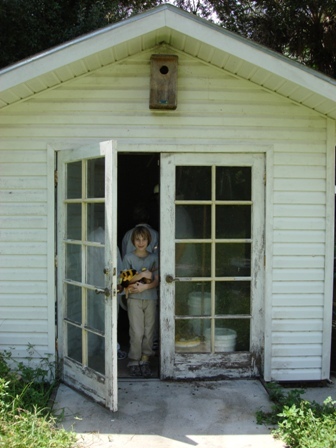 It is a learning curve for the new beekeeper to determine when to re-queen a bee hive. Queen bees can be bought from various companies and are sent through the mail. They’ve been sending queen bees through the mail since 1886. You can order a gentle blond (Cordovan) queen, a Hawaiian queen, a Georgia Purvis brothers queen, Russian queens bred to Carniolan “yugo” drones in California and many, many more. I always find out where my local beekeeping association are getting their queens. I’ve got a Purvis queen, two Hawaiian queens, and a wild queen in my boxes right now. The breeding of bees is a broad topic, but there is no question that a quality-bred queen is the most desirable. A box of bees sent through the mail. A box of queen bees ordered through the mail. 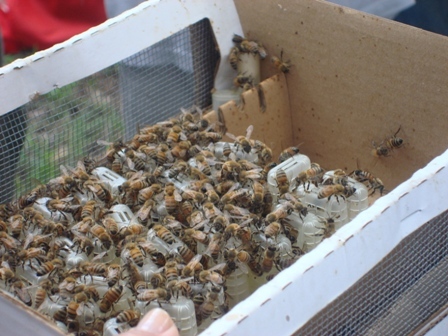 Each queen comes in a little plastic container with several attendant bees and some peppermint candy for her to eat. Keith Councell is clipping this queen's wings so she won't fly away. This does not hurt her in any way. The dimensions of bee hives and frames are the same throughout the world. The standard 10-frame box is used for brood (the bottom box where they keep their babies and food). The box that is stacked on top of the main brood chamber is called a “super”. The super holds the honey that we harvest from the bees. There is a wire mesh piece that goes between the bottom brood box and the super to keep the queen from laying eggs in the super. It is appropriately named a “queen excluder”. It’s important to always leave the bees enough honey for them to sustain themselves and not take it all from them. I’ve seen brood boxes with eight supers stacked on top of them. That ‘s a lot of honey. A swarm of bees will move themselves into any container they find suitable as a home. Bird houses are their favorite. A beekeeper can’t tend the bees when they’re in a bird house though (such as re-queening the colony). 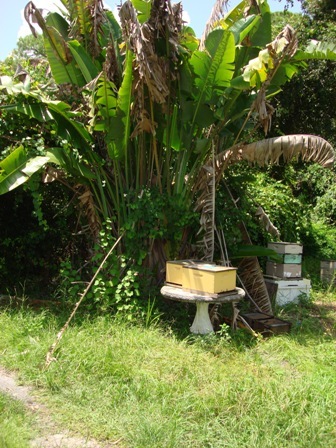 When bees become wild (feral), they eventually become Africanized in Florida. When a beekeeper re-queens a colony, it prevents the Africanization of the colony and keeps them gentle. 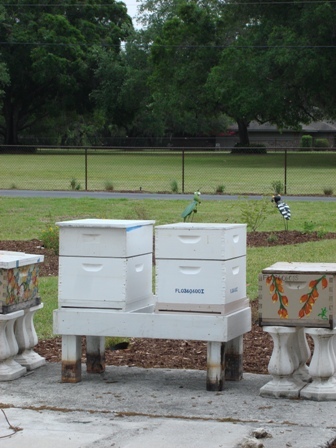 Africanized bees are spreading through several states. Keith Councell (president of our local bee association) did a radio broadcast this week that is worth a listen. It’s very interesting and the discussion is easy to follow. 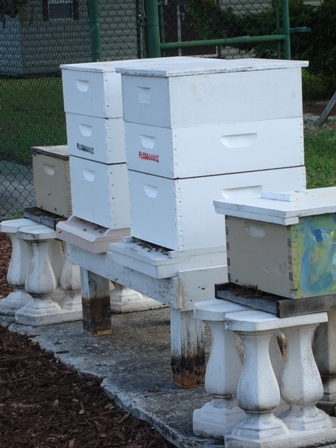 He discusses what you need to do to set up and maintain your own beehive in your own backyard in Southwest Florida. Keith said the bees will not bother your neighbors. To listen to his broadcast on WGCU National Public Radio, click here. 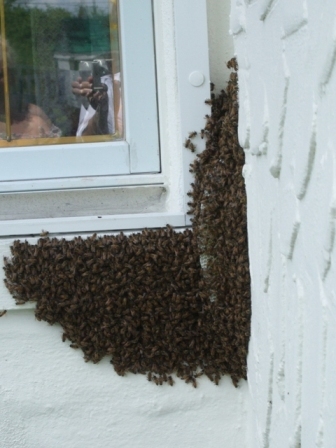 A colony of bees living on and in the exterior wall of my mom's house. Watching them through the window was fascinating and very addictive. These bees were relatively gentle bees. An Africanized bee has a "hot" sting and tends to bump against you and hit you. When Africanized bees get angry, they stay angry for days. Bees have been producing honey for 150 million years. They have found cave drawings in the Cave of the Spider in Spain that depict a figure taking honey from a hive. The drawing is estimated to be 15,000 years old. The Romans accepted honey as payment for taxes. The Mayans held honey sacred. The Egyptians used honey as a wound treatment and it was discovered in the tomb of King Tut. It was still edible because honey doesn’t spoil. The Land of Milk and Honey (Northern Israel) has recently found bee hives kept by a beekeeper that are three thousand years old. It is clear that Honey has been used for a very long time. Yes, honey is sugar. It is also a medicine. The medical profession is now taking a closer look at honey because of all the problems we are having with antibiotic resistance. 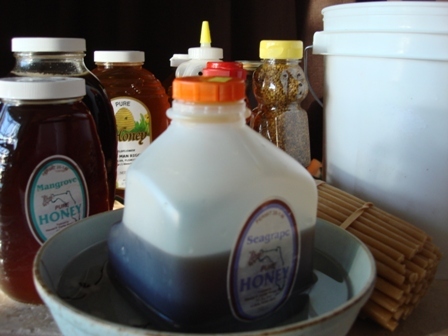 Studies show that honey quickly sterilizes Staphylococcus aureus on wounds. Honey actually cleans the wound and “activates the immune system response to the infection”… Tropical Doctor 1980; 10(2):91. A biochemist named Peter Molan found that Manuka honey (Leptospermum scoparium) is effective in killing staphylococcus aureus. Apparently, the honey has a phytochemical compound in it. 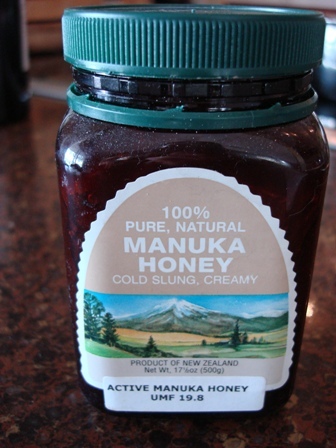 Manuka honey from New Zealand. 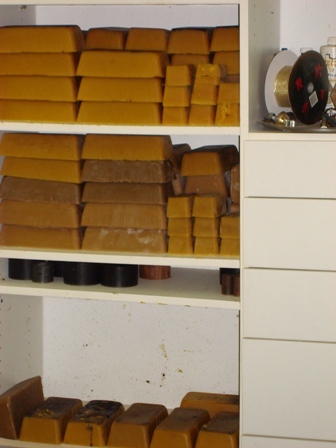 The Australian Therapeutic Goods Admininstration approved honey as a medicine in Australia in 1999. 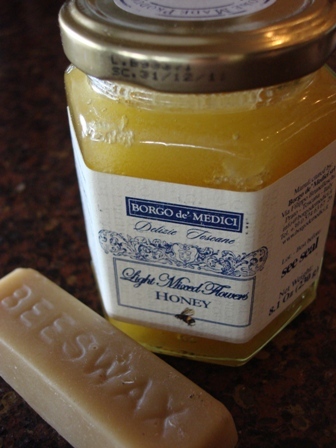 There is a company called Medihoney that sells medical honey specifically for wounds. They say that it provides a protective barrier, releases hydrogen peroxide while killing germs, reduces inflammation and speeds healing. Medihoney is standardized for medical use. 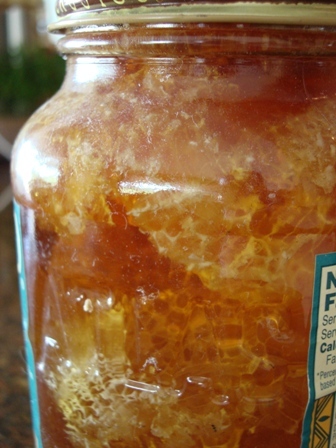 Children under the age of one should never be given honey orally because there is a risk of botulism. However, it is still safe to use it externally on their scrapes and scratches. Medical treatment with honey , bee venom and other honeybee products is called apitherapy. Some of the afflictions that are treated with apitherapy are multiple sclerosis, arthritis, pain, gout, shingles, burns, tendonitis and infections. 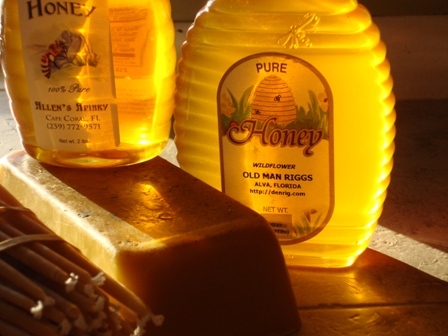 There are more than 300 honeys available in the United States. (Did you know there is a poison ivy honey?) There are 10 top producing states that produce 75% of the honey each year in the U.S. 2009 was the worst year for honey production in history. Let’s hope that 2010 is a better year. It is believed that honey has a calming effect on the body, promotes sleep and aids digestion. My favorite local honey supplier. 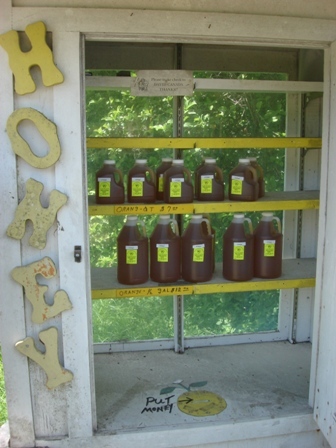 There's a slot to put your money into when you pick your honey. Gee, we don't see this system much anymore. I’ve noticed a lot of talk about honey lately… it worries me. If everybody finds out how good it is, there won’t be enough to go around. Then again, that might convince more people to keep their own bees and that would be a great thing. I just can’t fathom the thought of a world without honey…or bees. Grayson and I love honey. We know that it never spoils, so we continue to collect different kinds. Our honey collection makes us proud. We love to try honey from different places. 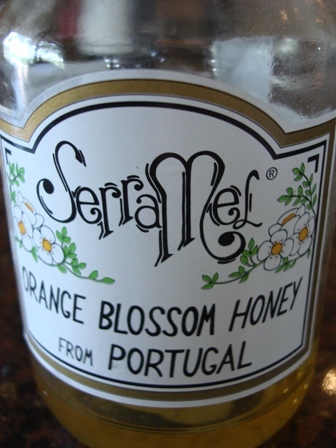 We usually reserve our local honey for everyday use and keep the “foreign” honey for tasting. Honey does not need to be stored in the refrigerator. 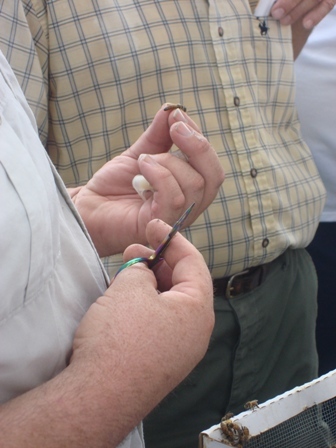 One of our local BASF members, Tom Allen, is an entymologist that has dedicated his life to preserving wildlife. Not only is his honey delicious (honey on the left in the above picture), but his wildlife artwork makes my jaw hit the ground. Check out his website to see for yourself. 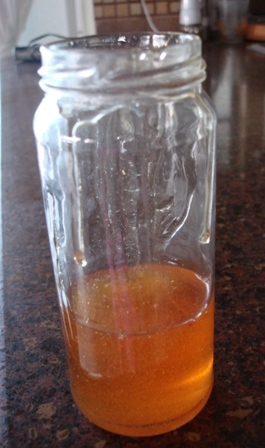 Honey from bees that were removed from our neighbors house...10 years ago. Manuka honey from New Zealand. It has antibacterial properties. It has an acquired taste. 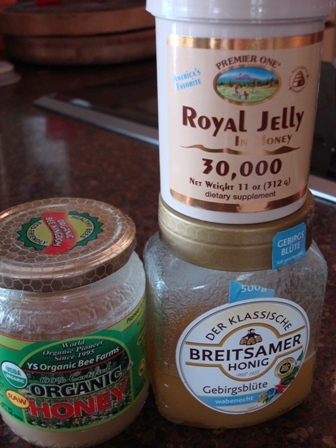 Creamed German mountain flower honey, organic creamed honey, and royal jelly. 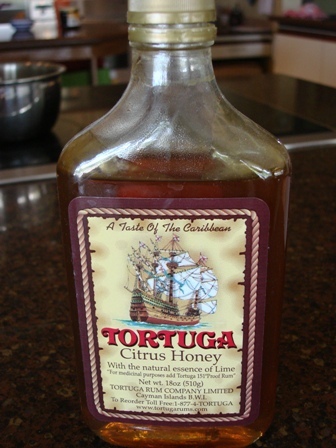 Honey with added lime flavor made by Tortuga Rum Company in the Cayman Islands. 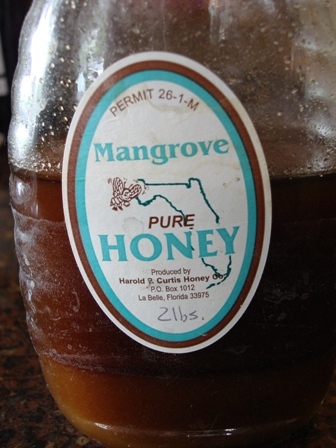 Local mangrove honey from Sanibel Island in Southwest Florida. 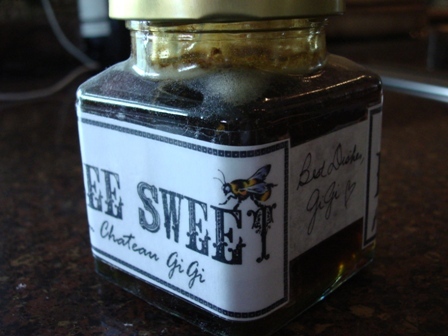 My mom's honey from the bees that took up residence in an exterior wall of her house, "Chateau GiGi". Creamed Hawaiian Honey...OMG it's good! 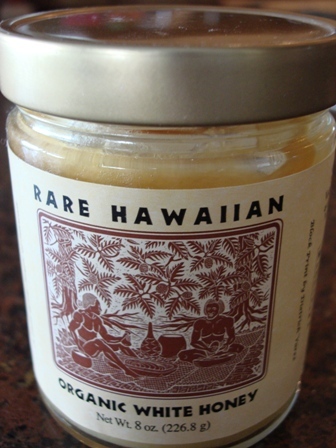 This organic Hawaiian honey comes from a company called The Volcano Island Honey Company. I’ve ordered all their honey products. I used a miniature spatula to get every bit out of the jar. The organic white honey with Hawaiian lilikoi is my favorite. The label says it's homemade Italian honey. This one won't be in the collection long... it's almost gone. 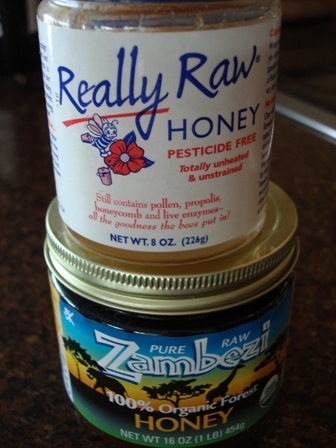 Organic honey from the Zambezi River in Zambia, Africa. The honey on the top is a "raw" honey with a piece of the comb inside (it tastes like creamed honey). 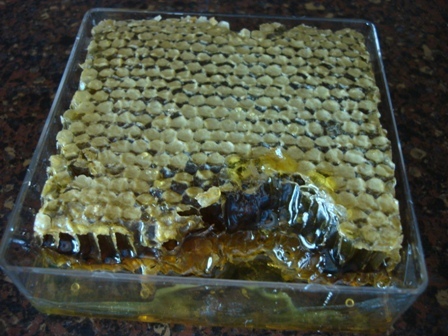 Local honey comb . Grayson and I try to hide this from each other. Seagrape honey from Sanibel Island. The honey in the above picture is in a bowl with water. It creates a moat to keep the ants out of the honey. It doesn’t bother me too much that the ants want it. I’ve decided to use the ants as a gauge to decide if a sweetener is good for us. My experience is that the ants will not go near apartame, saccharin, xylitol, sucralose, or stevia. The ants go to great lengths to get to the honey though. I’m sticking with them. Maybe they know something we don’t. The honey that is clearly missing from the pictures is tupelo honey. It is the best tasting honey on the planet. I have ordered it from L.L. Lanier & Sons for the past 10 years. It doesn’t stay in the house long… it’s that good. 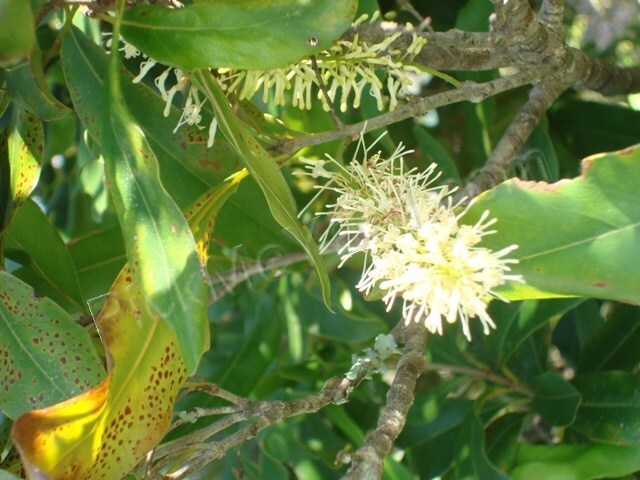 Tupelo honey is a very unique honey from the tupelo gum tree. It has a low sucrose percentage which has allowed some diabetics to have it. Chinese honey is probably the only honey we won’t knowingly buy or eat. China is the world’s top honey producer. They use sneaky ways to undercut the U.S. honey market. They use chemicals that keep their bees healthy , but those chemicals end up in the honey. These chemicals have been banned for use with bees in the U.S. and Europe. A great book for learning more about bees and honey (and a great read) is Robbing the Bees: A Biography of Honey–The Sweet Liquid Gold that Seduced the World, by Holley Bishop. Some bee books for kids are The Life and Times of the Honey Bee by Charles Micucci, The Lifecycle of the Honeybee and Hooray for Beekeeping by Bobbie Kalman. NOVA has a great website about bees with some incredibly interesting and fun facts. Many commercial beekeepers don’t keep bees for honey these days. They would never be able to make ends meet in the honey business. Most commercial beekeepers keep their bees to pollinate crops. We have a local beekeeper with over 10,000 hives. He trucks thousands of his hives from Florida to California each year to pollinate almond trees.